1_great_shop has no other items for sale. There are 877 items available. Please enter a number less than or equal to 877. Thank you for making this available and for prompt shipping! Awesome seller! Ordered Friday after work and beat me home Monday! I bought combo 2 batteries but I receive only one. Ordered Two Dewalt 20 volt 5ah liion batteries. They were date coded only a few months old & are new. Last year I purchased several different aftermarket packs. All were sub standard quality in some way, they were a waist of money. The aftermarket cells do work but the capacity is grossly overrated and after dissecting them it’s obvious cheap low quality cells were used in all. At under $50 per 5Ah pack there’s no reason to risk buying the cheap knockoff packs. You might save a couple bucks but I assure you they won’t run your tools as long or as strong or continue to accept a charge as well as the genuine dewalt pack. There’s honestly a difference. 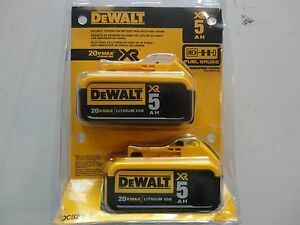 Great deal on authentic DeWalt 20v max batteries. These are original DeWalt batteries and they really seem to hold a charge. The 5.0Ah batteries give the best bang for your buck while keeping the total weight of the tool manageable. Depending on the model of charger used, they will recharge fully within an hour or less. Wish I had invented this little tool! There is only one drawback to these adapters, they are sometimes difficult to remove from my 18 volt tools I'm using the on. I don't have to buy all new 18 volt tools. This little bugger works like a champ and my investment for this and a couple batteries is nothing compared to having to replace my six 18 volt tools that are still in excellent condition. I only wish I had thought of it. Very Nice Batteries at a Good Price. Great batteries at a very good price. Lots of capacity and work in my charger. Current date codes so they have not been sitting on a shelf for years. Love 20v Dewalt tools. And the batteries are awesome as well. I am in construction. I use my Dewalt impacts every day. Batteries last for several years when you keep them charged properly.